The City of Dublin introduced the 2012 Community Plan amendment process to the public at an open house on Thursday, June 14 at the Dublin Community Recreation Center. The City’s Planning Division provided an overview of the project objectives, process and opportunities for public review and involvement. 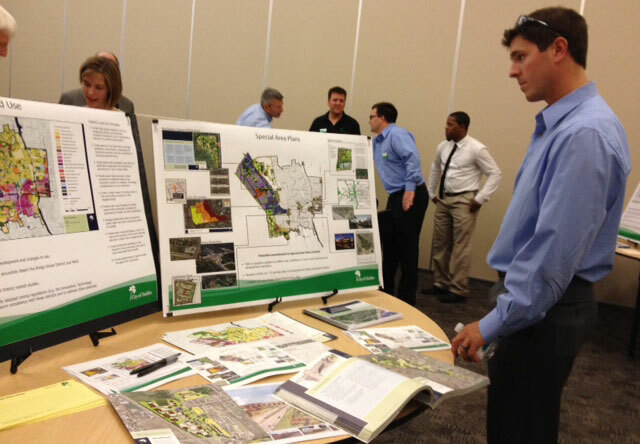 The open house included stations focused on each chapter of the Community Plan, with posters illustrating the types of changes that will be considered as part of the 2012 Plan update. City staff members were available to answer questions and provide additional information. The open house also served as the public launch of the new Community Plan website. Participants were invited to explore the website at a station equipped with iPad tablet devices and staff members used the website’s iPad-enabled interactive maps to review specific areas of interest with attendees.